More Info – Despite the specs that say certain hitch carriers can hold 300+ lbs, the car itself is the limiting factor for weight capacity. Most passenger car hitches are Class 1 and rated for 2000 lbs of towing with a 200-lb tongue limit. But the car’s tongue limit is often less. Do your research! VW’s passenger car tongue capacity is 175 lbs. 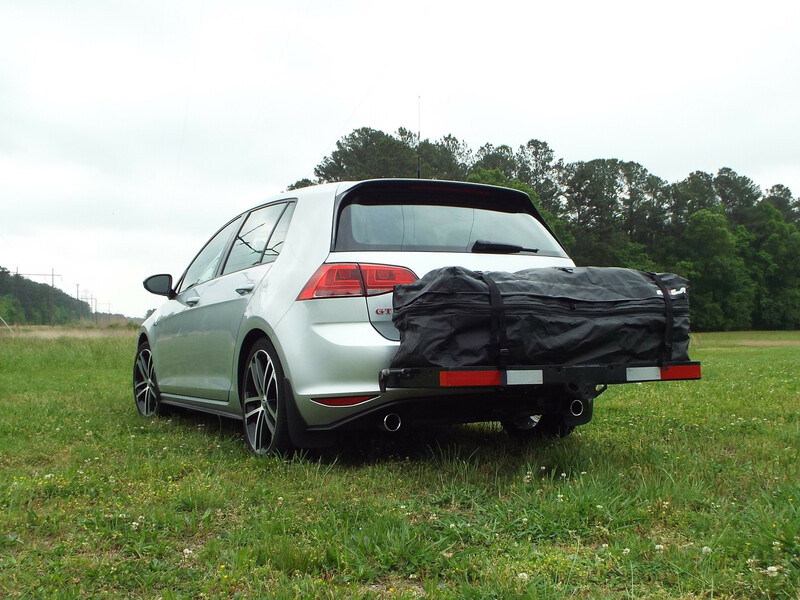 The cargo carrier weighs ~40 lbs and cantilevered weight on a carrier amplifies the force applied to the hitch. A prudent driver should consider limiting the hitch carrier’s load to 100 lbs, including whatever container is used to hold loose cargo. 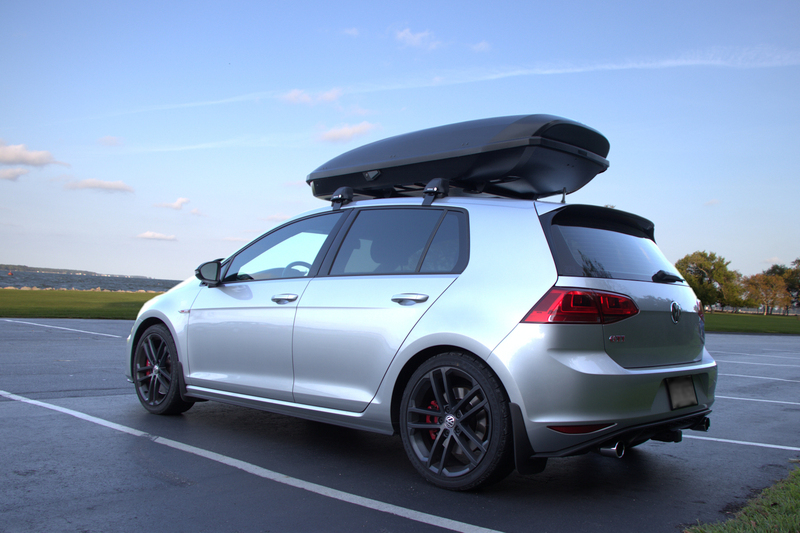 More Info – Roof weight capacity on most VW’s is 165 lbs, including the weight of the cargo box and roof rack. 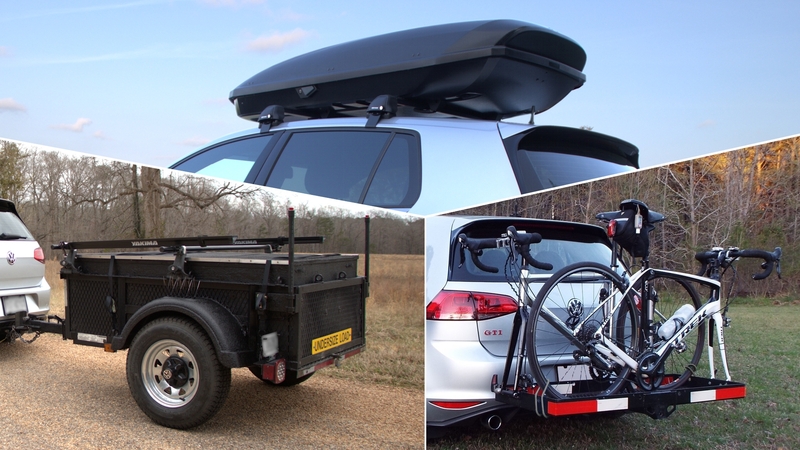 Most roof racks have a capacity to match that, but some have a lower capacity. Do your research! In short, the larger the box, the less weight it can hold. A 21 cubic-foot box may weigh sixty pounds or more, limiting the cargo itself to less than 100 lbs. The capacity is even lower if the cargo box isn’t riding alone on the rack. More aero than a cargo box (if cargo is covered) since the trailer is in the car’s draft. More Info – Towing capacity is often not published for passenger cars. Limiting total trailer weight to 1000 lbs is generally safe, as is limiting travel speeds while towing. Brakes are not required on lightweight trailers (<1500 lbs) in the majority of states. Check the law in your state. Load heavy items over the axle (slightly forward of it) and balance the load to achieve a tongue weight of ~10-15% of trailer weight. Many small trailer tires are speed rated to only 65 mph. Some small trailers, particularly the bolt-together specimens found at discount stores, are “speed rated” to just 45 mph. Do your research! 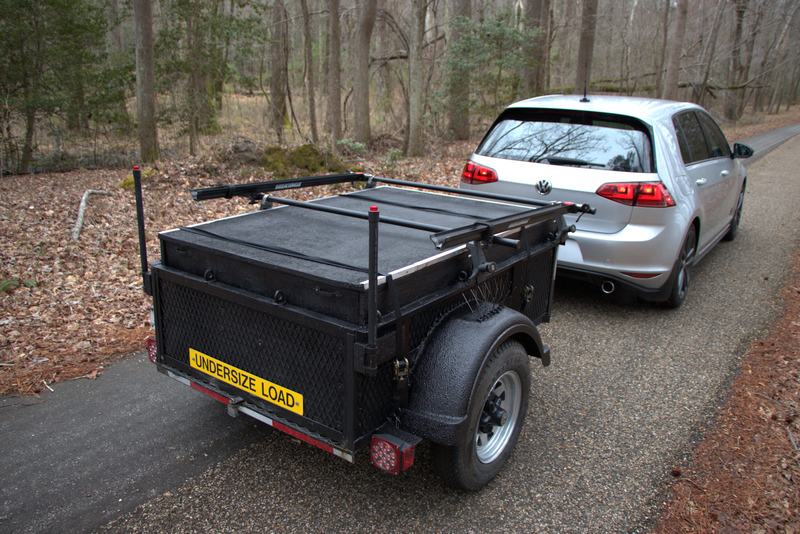 Read this article for more information on my claim that a small utility trailer can be quieter and more fuel efficient than a rooftop cargo box. VW says their cars aren’t for towing, then spends eight pages telling us how to tow with their products. HAHA! The tail lights are barely visible to other passenger cars in the zipped position (trucks/SUVs have a better view). Expanded to 11.5 cubic feet, I have no doubt that the tail lights would be completely obscured. The hatch rubs on the bag in the zipped position, but it will open. New ball with a Tow Ready bumper guard, etrailer.com item #80400 (see it at https://www.etrailer.com/Accessories-and-Parts/Tow-Ready/80400.html). This entry was posted in Trailer/Cargo. Bookmark the permalink.